I just wanted to post a quick little “billet” as we say in French, to share and spread the amour. 🙂 My fellow blogger Nathalie of The Parisienne was featered the other day in L’Express Styles and she was so generous to reference Prête-Moi Paris as one of her go-to blogs of Paris. I felt honored to be mentioned amongst just a few others, while there are so very many wonderful bloggers out there that love to pay hommage to this city that we love so much. 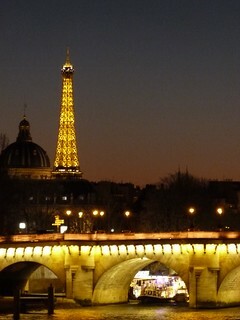 I love when people love Paris without hesitation. (This doesn’t mean they must love everything, because loving Paris also means accepting her with her unpleasant sides too even if we complain about them). Well, I do. I have a seat, and so do you! 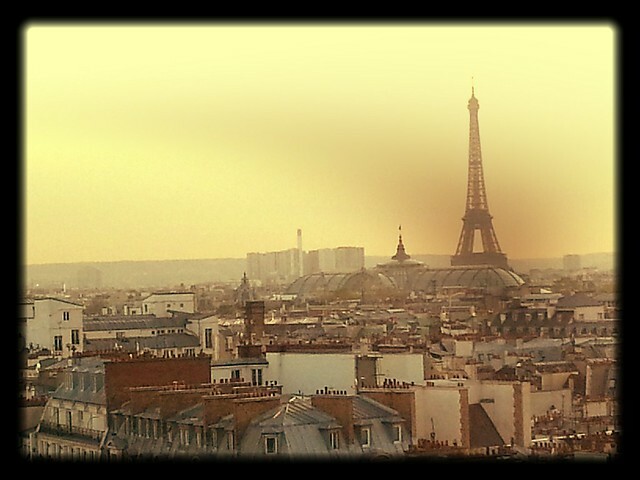 On top of Le Printemps Haussman, on a café terrace with a beverage in hand, to enjoy the incredible panoramic view. I literally wrote “Sprintemps” in the title before correcting it to “Springtime”. I think my franglais has gotten a little out of hand. But that isn’t the subject of this post. Or is it…. 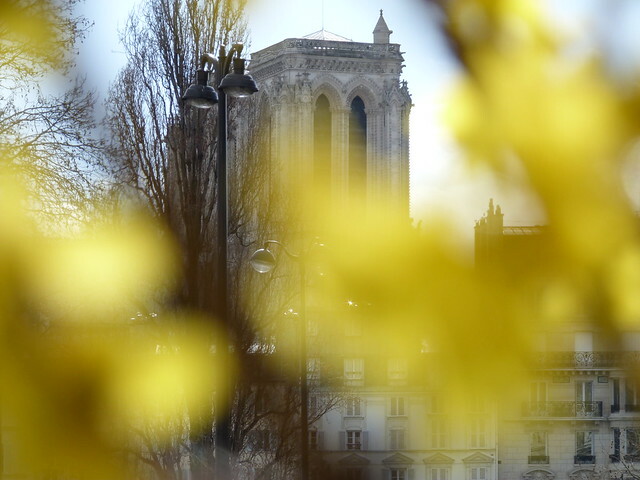 If you listen closely in the beginning of Springtime in Paris, you can almost hear a collective sigh.. Aaaaaaaaahhhh! The light comes back and we all feel a release of pressure as we emerge from under the gray skies. The Paris love-locks… I know, I know. 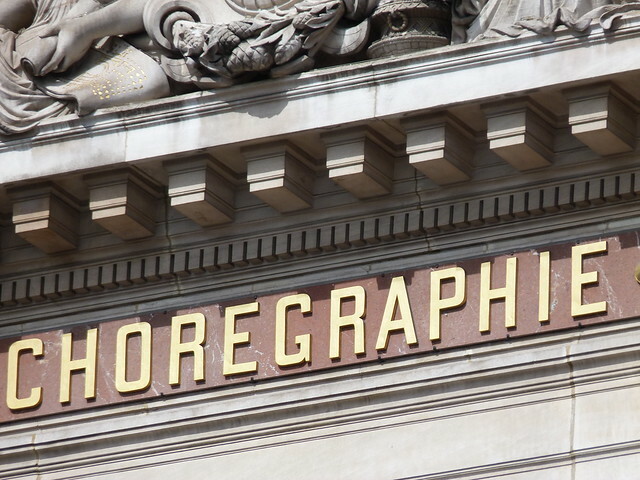 We have all discussed, photographed and blogged the death out of these little objects… They have a turbulent existence it would seem… All these declarations of passion, desire and commitment have become cumbersome to the city of Paris, but no one wants to discard them. 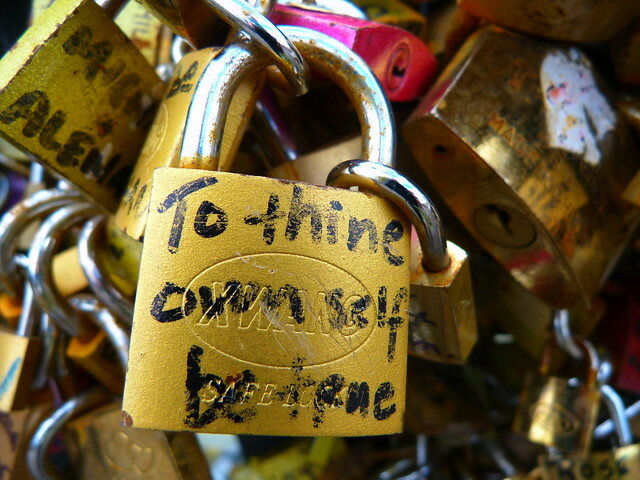 In a recent article in the Marianne magazine (a leftist French publication) there was an article about these locks and the weight they pull (and place) in the very heart of the city of lights, the city of love. I posted about this bubbly brand back in 2012, but did you know that Mon Champagne now delivers, in Paris, in less than three hours?!? I mean we all know how bad a champagne emergency is, right?!?!? LOL! Okay, all kidding aside, who wants to lug six bottles of champagne home in a caddie on the metro? Pas moi. Plus the delivery guys (on bicycles = they are in shape) are claimed to be hot! Hmmmm… this could be a new way to meet a French man for you single ladies out there! Aaaand, EVEN MORE EXCITING is the Champagne Box. 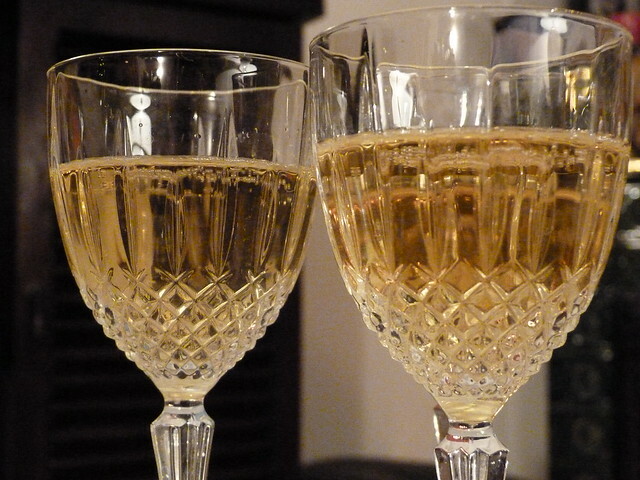 My friends over there are crowd funding to launch the product so hop on board and offer Mon Champagne your support. This is going to be awesome when it launches. Plus for your contribution, you can have cool stuff! http://kisskissbankbank.com/champagne-box You have until the 14th of May to participate! 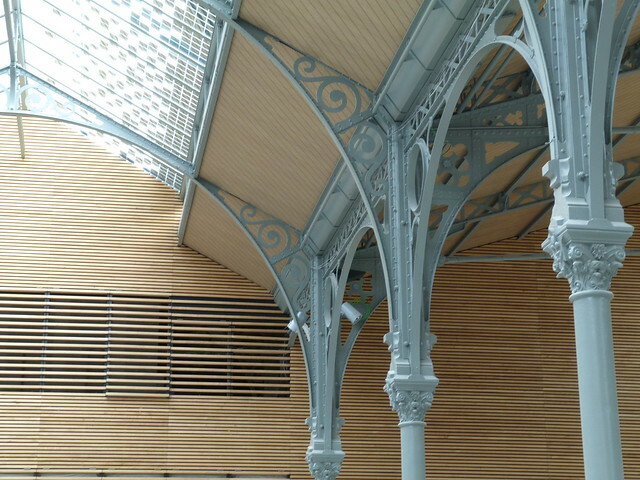 The Carreau du Temple, that I fell in love with last year, is now having it’s grand opening (they seem to have had a few non-grand openings, but this one seems to be the big one). April 25-27th. The event is a weekend surrounding the body with : music, dance, “voguing”, fashion, design, shows, martial arts … and more. 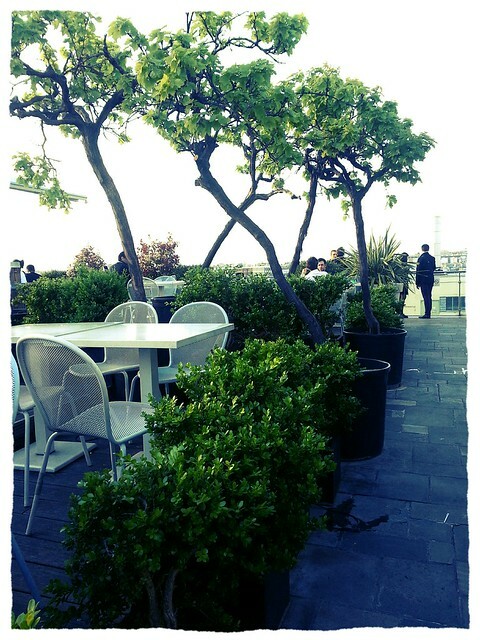 I blogged about a darling little café quiiiiiite some time ago. Le Village café in the 10th, now has an online boutique. Thought I would share that with you all. Again out on an evening stroll along the Seine, I once more found myself armed with my camera, and free to capture as many shots as my greedy eyes so desired. 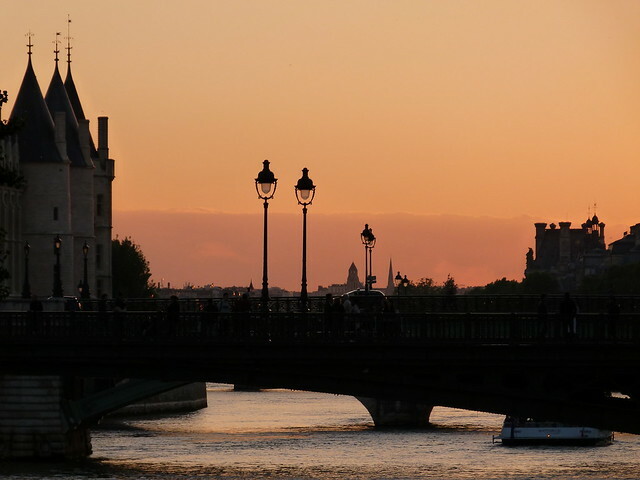 I have said it before, and I’ll repeat myself over and over, Paris is beautiful during the day (especially when the sun is going at full blast), but NOTHING beats Paris at night. A special glow falls upon her just after the sunset. I frame all my shots, and take them WITHOUT a tripod. I don’t even edit them, except for a tiny bit of cropping occasionally if my framing is a tad off, but that’s it. I like to keep my images pretty “au naturel” and not doctor them up with a lot of image editing. (Plus that’s time consuming), so I take great care in each shot, I do a lot of breath holding to keep my camera from jiggling when I press the trigger, and I use the functions on my camera do add or subtract light. 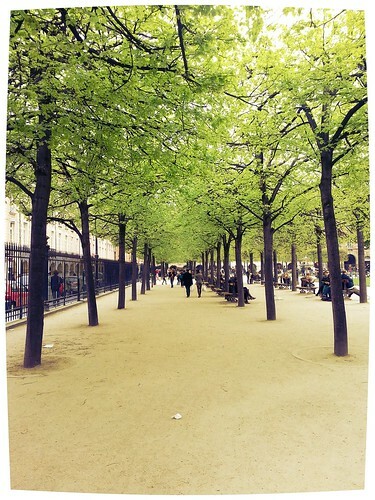 I have been in Paris for over 11 years now. Wow. It seems so long to me. 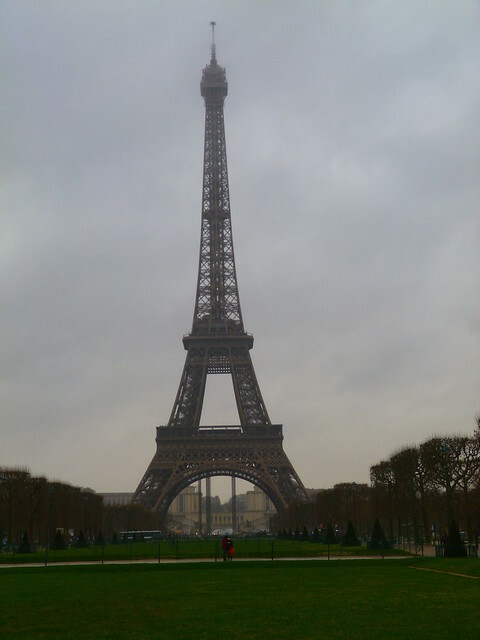 And no matter how many times I go to see the Eiffel Tower, I always always take a picture of her. She is beautiful. Weather it is against a grey cloud-cast sky, or dazzling beneath a vibrant evening blue hue, she is the star of this city, and everyone who comes her heads to her feet to pay hommage in the best way we modern humans know how : by taking her picture. 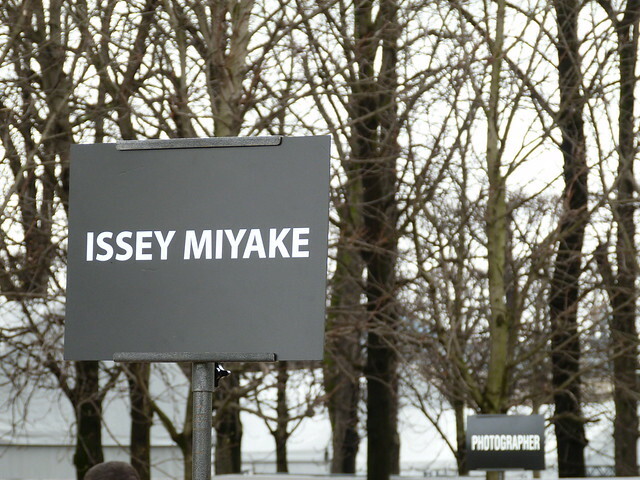 … I skipped over to the Tuileries fashion week tent on my lunch the other day to snap some street style shots outside of the Issey Miyake show. There was a slew of photographers and bloggers all waiting for the fashion people to pour out of the venue so they could snap quick pics to toss up on the web.